In spite of valiant attempts by my fellow broadcast meteorologists to stop it, the so-called polar vortex is back and being blamed for just about everything again. Let me show you why this is dead wrong, and if you see a story in mass media blaming a cold air outbreak on the polar vortex, I can say categorically that it’s wrong. DEAD WRONG. There IS such a thing as a polar vortex and a good quick summary of it is here on Wikipedia. A polar vortex is a persistent, large-scale cyclone that circles either of the planet’s geographical poles. On Earth, the base of the polar vortices are located in the middle and upper troposphere and extend into the stratosphere. They surround the polar highs and lie in the wake of the polar front. These cold-core low-pressure areas strengthen in the winter and weaken in the summer due to their dependence upon the temperature differential between the equator and the poles. 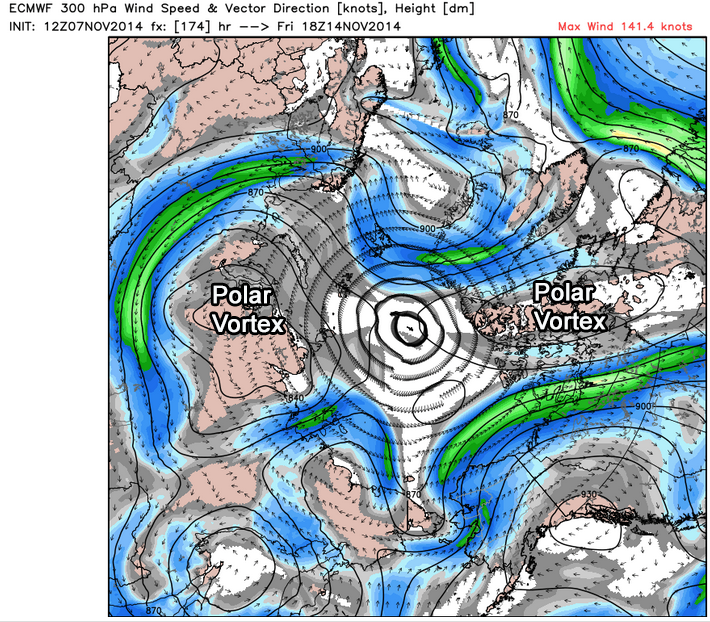 …The Northern Hemisphere vortex often contains two low pressure centers, one near Baffin Island, Canada and the other over northeast Siberia. From the ECMWF Model. Ctsy. Wx Bell. The map projection is different, but if you look closely you will see that the two polar vortex centers have not changed much. One is still over Northern Siberia, and the one near Greenland has shifted back to near Baffin Island. Although they have not changed much, there will be a lot of cold air entering the Midwest by this time Friday, so perhaps that convinces you that blaming the cold air outbreak on the polar vortex is not cutting it. Everyone is familiar with the weather because we all experience it on a daily basis, but resist the attempt to blame a natural phenomenon on any one thing. Rarely, if ever, does nature make it that simple. The wind flow aloft tends to steer the surface warm and cold pools, but they in turn steer the wind flow aloft! Part of the reason of the outbreak of cold air is a huge storm moving into Alaska, that will shift the storm track and favor a dump of cold air into Eastern North America next week. However, even that is a gross oversimplification (although this is technically not incorrect). The trick is to simplify atmospheric science without going so far that what you are saying is wrong! I do this every day on TV, and sometimes it isn’t easy! Blaming the cold air outbreak on the polar vortex is just plain wrong, and you will not likely hear anyone who has a real science background in atmospheric physics make a mistake like that. Let’s kill this monster, before it grows to big to stop! I’ve often wished for 3D presentations of what the winds aloft are doing. Much simplified of course. Then if you could rotate the model on three axes, you could look fro below as a groundling, or from above, etc. I would be very happy if arrows representing wind vectors could be projected on cloud formations. “We” know that trade wind cumulus is diven by convective heating of the surface ocean, but even if you never heard of Langmuir circulation the little arrows would be educational.